Preheat oven to 400. Combine olive oil and honey in a bowl. Add walnuts, and stir to combine. Place on baking sheet and spread out in a single layer. Place in oven for about 10 minutes; stir halfway through cooking. Remove from oven and sprinkle with sea salt. Spread onto parchment paper that has been sprayed with cooking spray and set aside to cool. Either in a large bowl or on individual serving plates arrange arugula and spinach. Add blueberries, feta cheese, and sliced red onion. 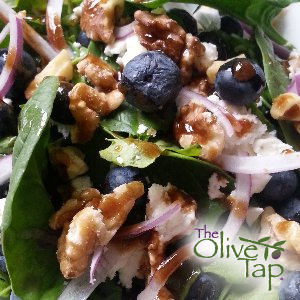 Drizzle with vinaigrette (toss if in a large bowl), and scatter walnuts over the top. Serve immediately. This salad is also wonderful with some sliced, grilled chicken breast over the top!